I'M NOT SURE OF THE ORIGIN of the notion that people read more during the summer. Personally, I think it is a myth. Most people I know actually read more during the winter when there are fewer fun outside activities. Nevertheless, in deference to tradition, here is a list of 10 of the best books I've come across in the last year. I heartily recommend all of them. 1. Drawing Life: Surviving the Unabomber by David Gelertner (Free Press, 1997, 159 pages): If there is any single book published in the last year that you must read it is this slim volume of prose from David Gelertner. Gelertner, the Yale professor who was injured by one of the Unabomber's mail bombs, is one of the finest writers of our time. This book is more than a free-flowing narrative of the attempt on his life and his painful recovery and return to life. It is a statement about what it is to be a thoughtful human being in an age where our collective refusal to make moral judgments has done irreparable harm to society. Many will find his scathing and insightful conclusions about liberalism unsettling. This is an unforgettable, beautiful book. 2.Biblical Literacy by Rabbi Joseph Telushkin (Morrow, 1997, 628 pages): The third in his series, Telushkin's user-friendly Jewish reference books (the first two were "Jewish Literacy" and "Jewish Wisdom"), "Biblical Literacy" is an excellent reintroduction to the basic text of Jewish life. Divided into sections summarizing "People and Events" and "Laws and Ideas" as well as a third which gives the 613 mitzvas of the Torah in order of appearance, this book is a valuable primer of Biblical knowledge. It is also chock full of helpful insights that will greatly enhance the understanding of even non- beginners. 3. Israel: A History by Martin Gilbert (Morrow, 1998, 750 pages): In this year of Israel's jubilee, it was inevitable that this most prolific of contemporary Jewish historians would weigh in with his own tome summarizing Israel's first 50 years. Gilbert, the British Jew who made his reputation as the author of the official biography of Winston Churchill, has become something of a history industry in recent years with an avalanche of general histories and map books. Written in his usual graceful and lively style aided by voluminous research, Gilbert's Israel is a worthy addition to anyone's library. 4. The Kidnaping of Edgardo Mortara by David I. Kertzer (Alfred A. Knopf, 1997, 350 pages): The heartbreaking story of how a Jewish boy was kidnaped from his family in the Italy of 1858 is more than just a tale of Jewish suffering in Christian Europe. Kertzer unravels all the threads of politics and intrigue to put the events of this shocking crime in perspective. It is an extraordinary example of narrative history at its best and will especially ring true for those who were disappointed by the recent Church report on the Vatican's role during the Holocaust. 5. 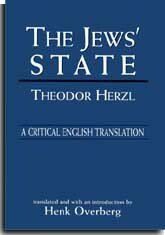 The Jews' State by Theodor Herzl (Jason Aronson, 1997, 271 pages): The book that everyone has heard of but few but scholars read. In this new version which is labeled "A Critical English Translation," Australian scholar Henk Overberg has combined a readable version of this most influential of all modern Jewish polemics with a useful introduction, glossary and bibliography. For those who want to know what all the fuss is about Zionism, a trip back to the ur-text would be an excellent idea. For an added bonus, try yet another important book of little read Zionist thought: "Every Individual A King: The Social and Political Thought of Ze'ev Vladimir Jabotinsky" by Raphaella Bilski Ben Hur (B'nai Brith Books, 1993, 303 pages); Jabotinsky, the father of the Likud movement was much slandered by his left-wing opponents. But this quintessential liberal nationalist has far more influence on modern Israel than is generally thought. Read this and you'll wish that Bibi and the rest of Jabotinsky's heirs would take his philosophy of individual rights more to heart. 6. Whittaker Chambers by Sam Tanenhaus (Random House, 1997, 638 pages): Misunderstood and castigated by the left during his lifetime, Chambers testimony against Communist traitor Alger Hiss was one of the seminal events of the Cold War. Vindicated by history, Chambers' reputation still suffers from the calumnies heaped upon him by Hiss' defenders. But in Tanenhaus' outstanding biography, readers gain more than an understanding of the Hiss case. It is the story of one man's heartbreaking battle with one of the great evils of the century. Yet this book is worth reading just for its own literary merit. Jewish readers will also find the portrait of the New York Jewish intellectual milieu which formed Chambers interesting. Simply one of the best American biographies in print. 7.A History of the American People by Paul Johnson (Harper Collins, 1997, 1,088 pages): It may not fit into your beachbag but the latest from the from Johnson is still worth the effort. The author of one of the best single volume histories of the Jewish people ("A History of the Jews"), Johnson is cranky, conservative, makes infuriating small mistakes and comes to some odd conclusions. But he is also one of the most readable and most original thinkers about modern history. His unabashed pro-Americanism is refreshing as is his extremely politically incorrect view of the world. 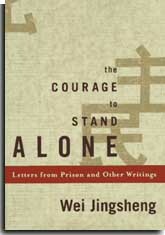 8.The Courage to Stand Alone by Wei Jingsheng (Viking, 1997, 286 pages): This compilation of letters from prison by one of the most courageous Chinese pro- democracy dissidents is a vivid reminder that the struggle for human rights in China is still alive. Recently released by Beijing as a reward to President Clinton for the president's betrayal of the cause of human rights, this book would make good airplane reading for Mr. Bill on his way to Tiananmen Square. 9. The Last Kabbalist of Lisbon by Richard Zimler (The Overlook Press, 1998, 318 pages): I generally detest mysteries but this spine-tingling yarn about the search for a murderer amid the chaos of the 1507 anti-Marrano pogrom in Lisbon, Portugal, held me riveted. Along with a great story, the reader is rewarded with a fascinating portrait of the existence of the Portuguese Jews who led perilous double lives as "New Christians." My favorite Jewish novel of the year. 10. Master and Commander by Patrick O'Brian (Norton, 1970, 412 pages): Looking for a great (non-Jewish) summer escape? This first of this classic series of 19 novels about the adventures of an English sailor and his doctor friend during the Napoleonic Wars is the answer. More than just adventures, these books are truly great literature with fascinating vignettes about anthropology, medicine, music, politics, navigation, warfare and other topics. Warning: These novels are highly addictive. Read one and you'll have to read the rest. 5/29/98: Double standards here and there: Hypocrisy raises its ugly head in Israel and the U.S.